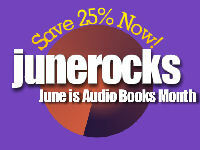 In honor of Audio Books Month save money on audio book downloads from CreateTimeAudio. We have updated our audio book discounts page as well for specific books on special offer as well as offers from other audio book stores. Use coupon code junerocks upon checkout at our store and you will save 25% on all orders through the end of this month. As a side note we also have started using Twitter and hope this brings our offer to more people so that they can enjoy the audio book listening experience. Our next posts will revolve around the Audie Award winners in our catalog.